Golden Technology Power Lift Chair Recliners PR505 PR-505 Recliner have perfected comfort. With the development of Golden Technology Power Lift Chair Recliner exclusive, patented MaxiComfort® positioning technology, Golden delivers the most advanced lift and recline chair available anywhere in the world! In the TV watching position, the power seat recliner glides while the footrest raises your feet, keeping the back of the chair angled at 90°. This design reduces friction and discomfort, and creates a soothing angle to cradle your body in comfort as you enjoy many of your favorite activities. You can read, watch TV, or use your laptop computer with ease! The MaxiComfort Power Lift Chair Recliner provides ergonomic upper body positioning in an effort to minimize neck and shoulder strain. Many people improve their sleep using the MaxiComfort® power lift chair recline system that glides you into the perfect sleep position with the touch of a button! If you find yourself sleeping in your recliner, experience the luxury of a powered recline transition that offers so many positions, you'll have your best night's sleep! The MaxiComfort lift and recline chair will become your luxurious escape day or night. Sneak away for a rejuvenating nap or nestle in for great night's sleep night after night! The Relaxer Lifting Chair models and the Windsor come standard with our new and exclusive AutoDrive hand control system. This technologically advanced system offers pre-programmed positions to give you an even more comfortable, customized recline experience! Find another favorite position? No problem! AutoDrive comes with two programmable memory buttons to be sure your favorite positions won't be lost! The MaxiComfort® patented power recline system is one-of-a-kind. No other recline system offers this many options with smooth, seat-gliding action, plus a state-of-the-art, easy to use hand control! When comparing MaxiComfort to other three-position lift chairs with an independent or infinite recline mechanism, MaxiComfort's power recline technologically advanced design significantly reduces shear forces on the body when reclining. 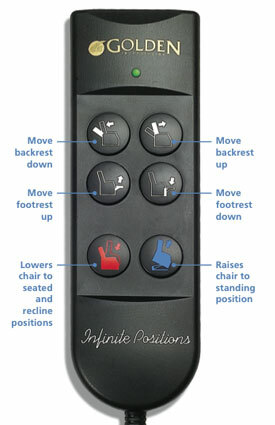 The hand wand's red and blue buttons are your action buttons - blue raises the chair to the standing position and red lowers the chair to the seated position and back to recline. The other four buttons allow you to customize your experience by moving the backrest and footrest independently in the smallest increments to find the perfect position for you. It's that simple! The Golden MaxiComfort(R) advanced power recline system is available in three different styles. The Relaxer PR756, available in medium and large sizes, features a four-pillow waterfall back which makes you feel like you're resting on a cloud. The adjustable lumbar support and plush, rounded armrests provide the right amount of support to the lower back and arms. Because the right fit is so important, the MaxiComforter PR505 series features a classic, seam back style in four different sizes for the perfect fit: junior petite for individuals 5'0" and under; small for individuals 5' to 5'3"; medium for individuals 5'4" to 5'10"; and large for individuals 5'11" to 6'2". The newest MaxiComfort model is the contemporary Windsor PR506, featuring a plush, two pillow back and overstuffed, flared armrests with a casual comfort feel. The Windsor is a medium frame chair designed to fit people 5'4" to 5'10". The Golden MaxiComfort line also offers a variety of luxurious fabrics to match any decor, including SofTouch with Stain Defense fabrics. Or choose our exclusive, lavish, breathable UltraleatherTM Brisa(R) fabric for the ultimate lift chair comfort experience! You can have it all with a MaxiComfort lift and recline chair, exclusively by the world's leading lift chair experts at Golden Technologies!